Keep track of evidence when the sun goes down using Evi-Lites from EVI-PAQ. The low-profile lights offer a bright and convenient solution to marking evidence at night. Each light is small enough to fit in the pocket and is easily transported. The light is activated with a quick twist of its base, making operation simple when lighting is limited. The lights can stand on their own, or be placed under a cone to signify evidence location. 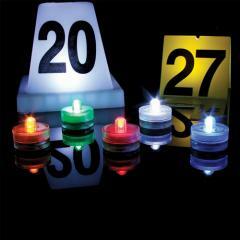 Available in multiple color options, the Evi-Lites make categorizing evidence at the scene a breeze. Designed for use any environment, the lights feature a waterproof and submersible construction that retains functionality regardless of extreme weather conditions.